The Belladrum drama has a Prologue and two Acts, three main protagonists, and a horde (sic) of extras. Enter first Joe Gibbs, landowner at Belladrum and host to the annual August Tartan Heart Festival. During clearing his fields after the Festival, he employs a metal detectorist to identify and get rid of all the left-behind tent pegs. Enter next that said detectorist, Eric Soane, who in August 2009 scanned the site and discovered a scatter of Roman denarii and some mediaeval coins. Enter third, Fraser Hunter, a principal Curator at the National Museum of Scotland, with an interest in hoards and Roman coins. He excavated the site in October 2012 to see if there were any more coins and to identify any obvious archaeology. 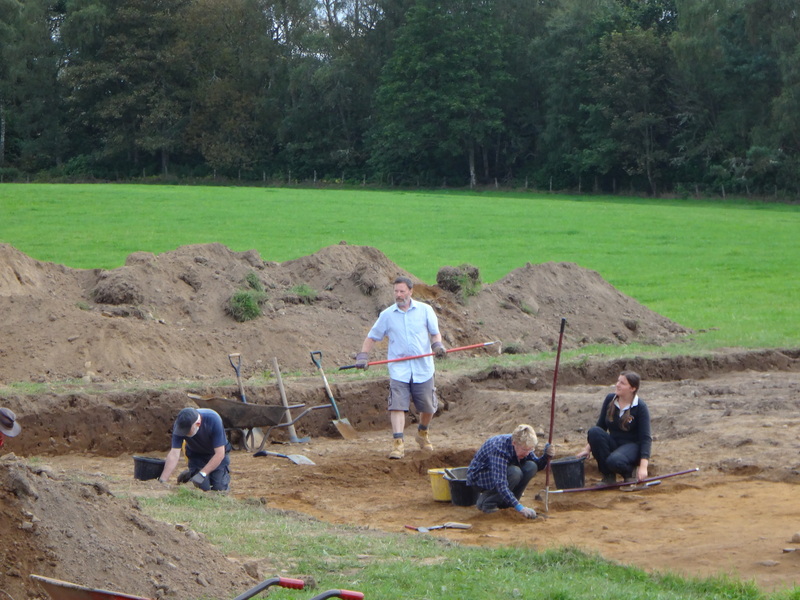 Enter last, the cast of thousands – well, maybe 20-30 – human diggers from around Scotland. There are two possible narratives, Fraser says. The coins were a hoard, a cache. Someone in the Iron Age wanted to find a good safe place to store his (presumably his) treasure. Or, second narrative, these scattered coins were a votive offering to the gods. There is evidence from other sites such as Birnie, Fraser says, that the hoards of coins do seem to have been placed in special previously holy places. And, why place the coins here? Birnie and Rhynie had hoards placed within settlement areas. Is there evidence of that at Belladrum? Or, if the coins were a votive offering, what was there at the time to focus the offering? A spring? An ancient site? And, most intriguingly, why 1000 years later were some mediaeval coins placed in the same area? This entry was posted in Bronze Age, Excavations, Iron Age, Loch Ness, Aird and Inverness, Neolithic and tagged Archaeological dig, archaeology, archaeology Scotland, belladrum, Bronze Age Archaeology, cobbling, coin hoard, Excavation, Fraser Hunter, iron age archaeology, neolithic archaeology, neolithic pottery, North of Scotland Archaeological Society, NOSAS, orthostats, post-ex, radiocarbon dates, recording and surveying, roman coins, Scottish archaeology, soil stratigraphy, turf wall, votive offering on September 15, 2014 by nosas. 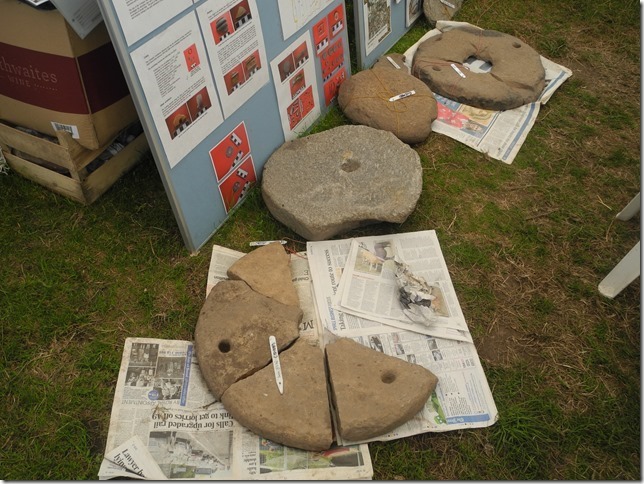 These excavations, in April and July 2014, were led by Candy Hatherley and form part of the University of Aberdeen Northern Picts Project. Cnoc Tigh (see also our earlier blog entry) and Tarlogie Dun are Iron Age round houses situated on the north coast of the Tarbat Peninsula in Easter Ross. They are both on the high ground about 200m back from the coast giving them spectacular views across the Dornoch Firth to Sutherland and up the Sutherland coast. 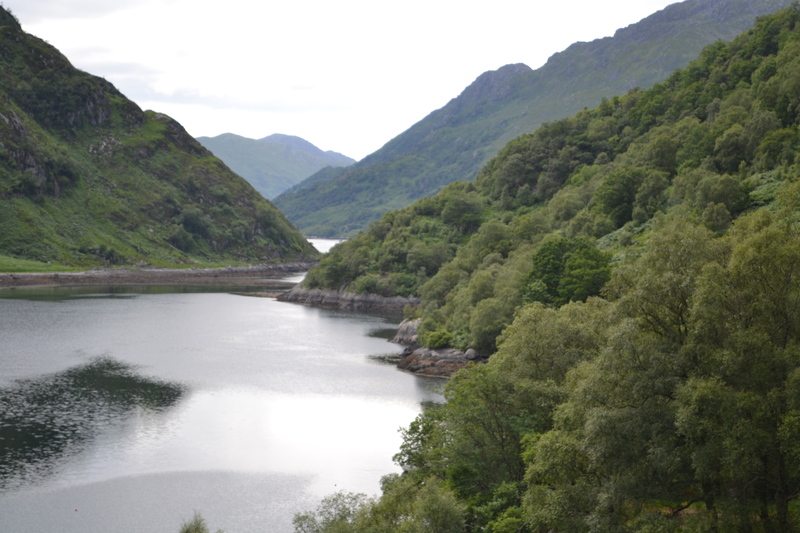 Neither site is naturally defensive and, though both have watercourses to one side creating a gorge and a steep bank to the sea on another side, that still leaves two sides open to the surrounding countryside. They differ from the three duns excavated by the Aberdeen University Team in 2013 in that these were all on the south side of the Tarbat Peninsular and were relatively defensible due to the natural features, although Tarrel is overlooked by the cliff on the landward side. Both Cnoc Tigh and Tarlogie appear to date from about 400 BC with occupation at Tarlogie lasting for 800 years to about 400AD. I do not know of any dates yet for the latest occupancy at Cnoc Tigh although I understand that suitable charcoal samples have been taken for dating. The 2014 excavations at both sites reveal severely robbed and damaged stone walls; there are discernible facing walls in a few locations but largely only the fill remains. Both sites show a lot of evidence of the structures changing with time. This entry was posted in Excavations, Iron Age, Tarbat and Easter Ross and tagged alloy broach, Archaeological dig, archaeology, archaeology Scotland, Cnoc Tigh, dun, Excavation, Iron Age Dun, Iron Age Round House, Morangie, North of Scotland Archaeological Society, NOSAS, Pictish, picts, quadcopter, quern stone, radiocarbon dates, Scottish archaeology, soapstone, Tarbat, tarlogie, whale tooth on September 11, 2014 by nosas. Just above the left bank of steep wooded ravine of the Balnagown river, remnants of a prehistoric dun (NH77NW 6, NH 7148 7616) sit on the sloped eminence surrounded by a complex of structural features, arguably belonging to it. The site has been known for a long time, as it still stands prominently and it is likely that it has not been disturbed by agricultural activities throughout centuries, although some possible robber trenches can be seen on the E side of the dun wall. Prevailing arguments suggesting that the roundhouse could carry the title of ‘a broch’ were usually subjected to narrow over-surface interpretations by only taking into consideration structural features such as the diameter of the house (13m), wall thickness (~6m on the surface) and its elaborate compounds that skirt the dun. However no comprehensive evaluation has been done since 1968 when OS did a basic descriptive survey and designated the structure as a dun. In order to expand the distributional scope of the late prehistoric structures in Tarbat peninsula and its environs, the team of archaeologists from the Aberdeen of University has targeted Scotsburn Dun in seeking to evaluate the underlying archaeology. A permission to locate 3m x 20m trench and extract effective dating material that would provide a chronological framework for the site was given by Historic Scotland Scheduled Monument Consent. 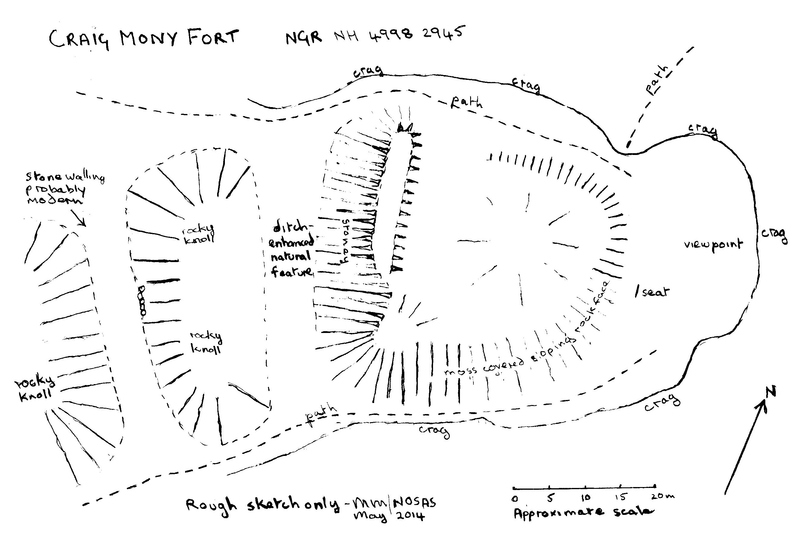 Additionally, to answer perhaps the most intriguing question­- whether the structure is a broch or a complex dun – authorisation was given to uncover the roundhouse wall and identify its external morphology that would allow drawing assumptions regarding its structural classification. Since this excavation was ongoing along other two digs in the area (Cnoc Tigh and Tarlogie Dun), the logistics were relatively subordinate especially in terms of people on the site. At least two archaeologists were working at Scotsburn with a kind help from volunteers living in the region. Yet even said that, the dig has not been crowded and therefore dealing with exceptionally complex archaeology and nearly 40m3 of deposited rubble extended original ten day dig to a four and a half week mattocking paradise. Realising the complexity of the site on the first day, it was decided to open 2m x 20m trench stretching NW-SE encompassing area between the roundhouse and the enclosure wall and another two earthworks giving another 6,8m extension for vegetation, top soil and limited latest collapse deposit clearance from the dun wall. 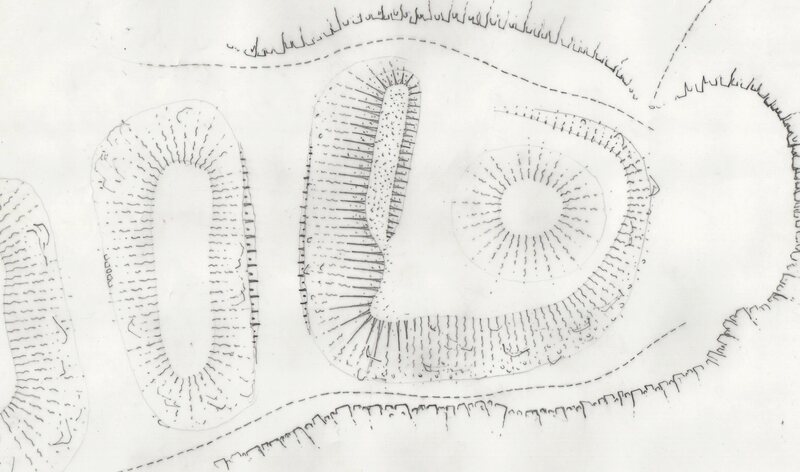 Unsurprisingly, it has been a highly demanding task to define structural features and reach occupation horizons by removing tons of collapsed stones; this process took nearly two weeks mainly allocating labour in two areas: a) between the roundhouse wall and the enclosure wall, and b) between the enclosure wall and the first earth bank. Aerial picture of the entire trench showing mid-excavation. This entry was posted in Excavations, Iron Age, Tarbat and Easter Ross and tagged Archaeological dig, archaeology, archaeology Scotland, broch, complex atlantic roundhouse, dun, Excavation, Iron Age Dun, iron age road, Iron Age Round House, iron age roundhouse, North of Scotland Archaeological Society, NOSAS, Pictish, picts, scotsburn, Scottish archaeology, Tarbat on September 1, 2014 by nosas.